My ESL students often ask me for recommendations for books to read. I always recommend books by John Grisham. Many of my students have already seen movies that were made based on his books, so they are indirectly familiar with him. I find that John Grisham books are an "easy" read. He's a great storyteller. This makes it easier and more compelling for ESL learners to read for pleasure and indirectly benefit from being exposed to how English is written. Most of my private ESL students are very advanced. These students primarily want to improve their speaking skills. They are frustrated with having to repeat themselves to their colleagues. Some try to handle this frustration by sticking to written communications and avoid face-to-face discussions. This is not to say that there are not other factors in improving one's English speaking skills. There is also vocabulary development (including idioms, slang, reductions, consistent use of contractions, etc.). I use the above three topics when native speakers have trouble understanding my students. I focus on word pronunciation through conversation practice and having students read aloud during our tutoring sessions. Intonation is fun. I describe it as the music of the English language. I show students through a "red hat" exercise how putting stress on different parts of a sentence can totally change the meaning of a sentence. These are the three main areas I focus on to help students be more easily understood by native English speakers, but as I mentioned above, they are not the only issues we work on. One aspect of business English that I teach my adult ESL students is how to write effective emails. In addition to the regular challenges of writing business emails, my students also have to learn about the tone of an email. This is actually important for all email writers, especially when writing business emails. Another thing that I believe is very important is an effective "subject" heading. The subject heading should be succinct and convey the main topic of the email. The reader should be able to look at the subject line and decide if the email is of interest. One mistake that many people make, not just ESL learners, is to send an email by hitting the "reply" button from an old message, but not changing the subject line. For example, I may have received an email from an ESL student with the subject heading "My writing sample." I respond to the student about the writing sample (no need to change the subject heading here), but then the student uses this email and simply hits "reply" (without changing the subject line), the next time that he or she wants to contact me. However, the subject of the new email might be a schedule change. In this case, the subject line should be changed to "Schedule change" or other some related phrase. Always using a subject line that is related to the topic of the current email is good business sense and is one component of a good business email. I worked with one of my ESL students today on her writing. She didn't really make too many mistakes in her writing samples, but she wanted to "write like a native speaker." I think that there are certain things that many native speakers will say, generally, the same way. However, depending on what is being said, there is great variation in the way that native English speakers speak and write. If the way an ESL learner says something is not wrong or awkward, I try to encourage them to have more faith in the way they are communicating. Of course, this is something that is more likely to happen with more advanced ESL learners. One of the more difficult things for ESL speakers to master is humor. Aspects of the English language (or any language, for that matter) that make humor difficult include: different definitions for the same word, different stress on a word can make the meaning different, vocabulary limitation, grammar tenses, etc. Just about all the things that an ESL student must learn to read, write, speak and understand English are necessary for ESL learners to, for example, understand a joke told in English. However, in addition to the language itself, there are also cultural references that the ESL student must know and understand to be able to understand a joke or other humor. When an ESL speaker does finally start to understand humor in English, then he or she will know that he or she is making progress. Of course, I'm not addressing the fact that different people, even speakers of the same language and from the same culture, just may not agree about what is funny. One of the cultural differences that many of my ESL students have to deal with in the U.S. is the concept of "tipping." "Tipping" is when you pay a service worker (waiter, waitress, parking valet, doorman, haircutter, etc.) an amount above the regular cost of the service they perform. The most common tipping scenario for most people is tipping a server (waiter or waitress) at a restaurant. The standard tip amount for servers is 15 to 20%. Apparently, in some countries, like Korea, food servers are not tipped. The gratuity (another word for "tip") is included in the cost of the food. I suppose servers in other countries may be paid more than the servers in the U.S.
Americans are very, very familiar with the custom of tipping in restaurants. We learn this in childhood from observing our parents in restaurants. Some of my ESL students accept this custom and "when in Rome..." I had one ESL student who was in the U.S. for over a year and he still only grudgingly paid tips. The topic of tipping comes up for me today because I am expecting a furniture delivery any minute. As furniture deliveries are not frequent in my life, I am unsure of the proper etiquette for tipping, or even if a tip is expected. So I searched online. Apparently, Americans (or at least those who write online) are divided on the issue. Some say you should tip, others say it's not expected. I still haven't figured out the final word; and the amount to tip is even more a mystery. I guess I'll wait and see how the delivery goes and make my decision then. As an ESL tutor, I don't think I'll be able to answer this question very well if it ever comes up. Apparently this "cultural difference" is even different in my culture! One of the ways that ESL tutors can supplement their income is by offering their editing services to ESL and other students. As a private ESL tutor, I don't advertise to do English editing work. However, at least once a month, I receive an inquiry about an editing job. I believe I've mentioned in the past that editing is not one of my favorite things to do. Actually, I love editing. I'll gladly do it for free for friends. I just don't usually like doing it as a paying job. More often than not, people asking for my editing services will say things like, "It doesn't need much editing; just a few grammar problems." Or, "You don't have to correct too much; I just want it to sound like a native English writer." While I (think I) understand what people are trying to convey when they tell me that their paper won't need much work, I often feel that people don't really understand what goes into editing a paper. For example, even if there are only a few necessary corrections, I still have to read the whole paper to find the errors. Even if there is only one error on a page, the whole page must be read and understood and checked. I've gotten used to people making these sorts of statements about their papers. I expect it, and I don't let that deter me from taking a job. The Past Perfect grammar tense is one of the past tenses that my ESL students regularly avoid using. It is one of the more difficult tenses for students to master because it includes a helping verb, plus a past participle. And if you add an adverb, keeping the order straight is always a challenge. The Past Perfect tense is used to talk about the past when there are two past tense events, or one past tense event and a particular time in the past. For example, "I had given up before she arrived." I think the other reason that ESL speakers avoid using the Past Perfect tense is because you really can express all that you need to express by using the Simple Past plus words like "before" and "after." Most of my new ESL students tell me that they want to learn new vocabulary. That's always a bit of a challenge for me because most of my students are advanced, so I don't know what vocabulary they already know. I usually try to embed new vocabulary into my other lesson plans. Another thing I do is try to find the areas my ESL students are interested in or what they do in their lives. I want the new vocabulary to be relevant to their lives and something they can begin using right away. Today, I was at a ballgame. While I was there, I was thinking about a couple of my ESL students and some relevant vocabulary. One student I was thinking about is married to a professional poker player. So, the term "full house" might be useful for her to know. Another of my students is heavily into baseball. So the term "full count" might be useful for him to know (although I'm sure he already knows it!). These two similar terms just reminded me of how English can sometimes be so precise and one small change can make a big difference in the meaning and usefulness of words. Back in July I wrote about correcting ESL students and how many of my students tell me that they wish native English speakers would correct them. I tell these students that most Americans might think it's rude to correct an ESL speaker and we usually will not do it, unless asked. I advise my students to ask people to correct them; if the relationships is an appropriate one. Interestingly, I have experienced very strongly what I told my ESL students we Americans feel. I feel that it would be very, very rude for me to offer her some suggestions or corrections to her English. It's almost like I would never even dream of doing it. So, I emphasize again, if you're an English language learner and you want native speakers to correct you, you must ask them to do so. When my private ESL students tell me that they want to improve their speaking skills, I always ask how they use their speaking skills and/or how they plan to use their speaking skills in the future. Some ESL students just want to improve their general English speaking skills. Some want to work on making small talk. And many want to improve their presentation skills. They want to feel comfortable making presentations on the job or in the classroom. For my ESL students who want to improve their speaking and presentation skills, I always recommend Toastmasters. It's a great organization and not very expensive. There are meetings all over the place. All an ESL student has to do to find local meetings is Google "Toastmasters meetings" and their location. I encourage students to try more than one meeting, as they are all a little different. They do all follow the same basic format, but some might be large, some small, and just have different "personalities." The other day I wrote about teaching the expression, "I don't drink," to ESL students. Currently, I'm learning from my students about drinking (and I mean drinking alcohol). I have a few ESL students who are visiting scholars, post-docs and PhD students. Since school is recently back in session at my local university, one of the topics that has come up a lot lately is drinking and getting a little tipsy, if not downright drunk. One ESL student told me about a recent birthday party she went to for one of the Korean students in one of her classes. All the party-goers were Asian (Koreans, Chinese and Japanese). She commented to me that they were all communicating in English with one another. And they were a little drunk. She talked about how easy it seemed to speak English and how they all communicated so well! I'm not encouraging getting drunk to improve your English, but it does reinforce to me how improved English language skills are often a result of self-confidence, and bravery. Drinking allowed my student to feel more at ease and not worry about making mistakes (she usually worries about her English-speaking skills even when with other ESL speakers). Working with a private ESL tutor allows students to build that self-confidence in a more lasting way. And without a hangover! In our first meeting together, I always do a needs assessment. I follow a form that I've developed. Using this form and asking other relevant questions as needed shows the potential student that they are working with a professional. Since they are paying good money for my lessons, this helps to set the tone of what they can expect and it impresses the potential student. Apparently, I'm one of a rare few ESL tutors in my area that offers a free first session. I don't understand why. It really pays off in the long run in finding quality students and happy students (and paying students!). Since I'm an ESL teacher, I probably pay more attention to the everyday use of the English language than other people. My ears are continually perking up to phrases, expression, idioms, and "strange" uses of English. Even when I walk to my English lessons, I hear or see things that I know my ESL students most likely will not know. In only a five minute walk, I encounter at least a couple of things that would be new to English language learners. If it's something useful or interesting, my next ESL student will benefit from my observation. I caught a part of "The View" on TV this morning and Whoopi Goldberg said, "I don't drink." It made me think of how an English language learner would interpret this sentence. Of course, it means, "I don't drink alcoholic beverages," but you'd never hear this longer sentence from a native English speaker. All native speakers will know that "I don't drink" means "I don't drink alcoholic beverages." I think this is a useful English phrase for ESL or EFL students to understand and to use, if needed. Most of my ESL students are advanced English speakers. They are really quite good! But, of course, some are better than others. And some make more measurable progress during our sessions than others. I’ve noticed a trend over the years. It seems that the ESL students who come to me from their late teens through their late 20s have much stronger English speaking skills my older students. However, I believe that English language learners of all ages can improve their English language skills. 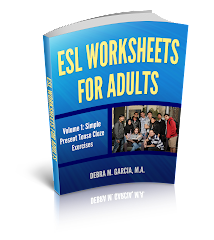 When I taught ESL at an adult school, we had students in their 70s who made progress! For ESL students, prepositions are "the final frontier." What I mean is that they are the most difficult thing for English language learners to master. It takes forever to get them all correct. Not only are there a ton of prepositions, but there can also be subtle nuances that a non-native English speaker may not pick up unless he or she is living in an English-speaking country for a long while. For example, the prepositions "to" and "with" can both follow the verb "talk." Both are correct. However, there may be some subtle differences depending on the speakers and the relationship they have. For example, if the boss of a company says, "I need to talk to you," I might be a little more worried than if he or she says, "I need to talk with you." "To," when using the verb "talk" is more of a one-way thing. One person is doing most of the talking and is in (at least) slightly more control than the person being talked to. "With" has more of a give-and-take meaning. We are both going to participate in the conversation as equals (or at least it makes it seem that we are equals). Probably the better preposition to teach ESL students with "talk" is "with." It is more neutral and, perhaps, more equal-sounding than using the preposition "to" with this verb. Using "with" will work better more times than using "to." The odds are in favor of "with." What do you do when your ESL students ask you a question and you don't know the answer? A lot of times, the answer truly is "because it's English." There isn't always logic or even a rule that covers how native speakers use English, especially spoken English. But if there is a "real" answer, or you suspect there is, and you don't know the answer, I believe the best thing is to tell the student you don't know and you will look it up and get back to them. I was looking at some e-products to recommend to some of my ESL students. "E-products" are things like e-books ("electronic books") that can be downloaded from the Internet. Some ESL topics I've seen are things like how to improve your pronunciation, reduce your accent, learn grammar, learn new vocabulary, etc. 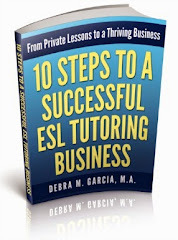 Some of these ESL products are free. Some sites charge money for their products. Here's my problem with most of the ESL learning tools I've come across so far: they have English mistakes in them! Now, I don't claim that I never make a typo, or even a grammar error, on my blog or on my ESL site. I sometimes don't have the time to go back and edit my writing. BUT, I'm not charging anything to read my words! The good and the bad are free here. I just think that if you are selling a product to help people learn English, then you have to use correct English! And if you are a student studying English, beware of products that have errors in the sales pitch! They'll probably have errors in the thing you pay for, too. I teach private ESL students one-to-one. I offer my students the option of one-hour, one-and-a-half hour, and two-hour lessons. I've found that the optimum time for a private ESL lesson is one-and-a-half hours. I highly recommend to all of my potential students that they take the one-and-a-half hour option and I give a significant price break for this option. Most of my students take this option and it works very well. They often remark on how quickly the time went by. The reason that I prefer one-and-a-half hour lessons is that one hour ESL lessons are too short and two hour lessons are too long. I believe that my students and I are able to accomplish the greatest amount of learning in this time period, without either of us becoming too exhausted. Most of my students are working adults who I meet after their long work days. Two-hour ESL lessons are just sometimes too much extra work for the day. I have had some students who travel very far and for this reason they prefer the longer two-hour lesson time period. A question that came up with one of my ESL writing students was how to write the time when using "a.m" or "p.m." In my experience, I've seen (and used), for example, "9am", "9 am", "9a.m. ", and "9 a.m." Everyone understands what time you are referring to if you use any of these. However, for formal writing, there are two correct ways: 9 a.m. and 9 A.M. There is a space between the numbers, periods between "a" and "m"' but no spaces between the two letters. This is according to Longman Advanced American Dictionary , my favorite ESL dictionary. Incidentally, "a.m" is an abbreviation for "ante meridiem," meaning "before noon." "P.M." is an abbreviatin for "post meridiem," meaning "after noon." There's no doubt that English language skills have the potential to improve people's lives. As an ESL tutor, I enjoy the benefits of self-employment: I get to "travel vicariously," I get to meet a lot of great people, and I get a great feeling of self-satisfaction. Teaching is also a way for me to contribute, to give back. Now, I've found another great way to give back and make a difference in the world. Kiva.org was featured today on the Oprah show. It's a website where you can make a very small loan (at least "small" for most of us) of only $25 (US) to people all over the world. The people you loan your money to are entrepreneurs in poorer countries; and you get to personally choose the person you loan your money to. These small loans can make a world of difference in people's lives. Please check out their website to get more information. Native English language speakers use idioms on a daily basis. In fact, we use them so regularly that we aren't even aware that some of them are idioms, or slang, or even euphemisms. One expression that is based on reality is "once in a blue moon." An example of this idiom would be "I only tutor ESL students from Germany once in a blue moon." This means that I do tutor ESL students from Germany, but only occasionally. Literally (or almost literally), a blue moon refers to the second full moon that occurs within a calendar month. This event only happens about once every two-and-a-half years. As for why astronomers call a second full moon in a month "blue," you'll have to visit someone else's blog! Idioms are extremely useful for English language learners to learn. I'd say that every single day someone communicates in English, they will use or encounter an idiom and/or slang. Is it a cell phone or a mobile phone? Here's another one of those American versus British vocabulary differences. The majority of Americans say "cell phone," although some are starting to say "mobile." I think that for English language learners, the best vocabulary to teach is the one that is used in the culture where they'll be living/visiting/studying. Although, the American English versus British English differences are useful for students to know. I've never been very interested in team sports. Individual sports have been more my thing. However, a few of my private ESL students have been very interested in baseball, in particular. As I've mentioned before, the best conversation topics for ESL classes (or private tutoring sessions) are things that your students are interested in or things that will help them with daily life or on the job. To date, I haven't had any professional baseball players (maybe someday), but I have had serious fans. There's a certain enthusiasm that some students have when talking about some topics, like baseball. I've learned a great deal about baseball in the U.S. from conversations with one of my Japanese students, in particular. He knows more about the game in this country than I can ever hope to know! It's another one of those cases where I'm able to learn from my students and my students are able to improve their English language speaking skills by talking about something they feel passionate about.